After a huge buzz over the upcoming biopic release on former prime minister Manmohan Singh, a new biopic is to all set to make an entry in the Bollywood industry. 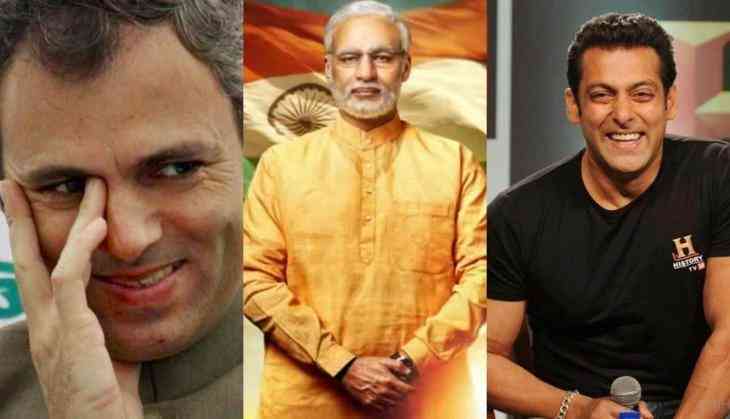 As soon actor Vivek Oberoi shared the first look of his upcoming flick Prime Minister Narendra Modi, the biopic on India's prime minister at present, a flood of mixed reaction started pouring on social media. One among those reaction is of former Jammu and Kashmir Chief Minister Omar Abdullah’s. Omar Abdullah mocked PM Narendra Modi over not getting someone of the calibre like Dr ex-PM Manmohan Singh who got veteran actor Anupam Kher portraying him on reel life. He further went on calling PM Modi ‘poor’ who had to settle down with Vivek Oberoi. The politician took Twitter to take a sarcastic dig at Modi. Omar Abdullah tweeted, "Life is unfair Dr Manmohan Singh got someone of the calibre of Anupam Kher. Poor Modi ji has to settle for Vivek Oberoi. Salman Khan hota toh kya maza aata". Life is unfair Dr Manmohan Singh got someone of the calibre of Anupam Kher. Poor Modi ji has to settle for Vivek Oberoi. Salman Khan hota toh kya maza aata. Let us tell you, a biopic ‘The Accidental Prime Minister’ on Dr Manmohan Singh is to release on January 11. In the film, Anupam Kher has played former PM Manmohan Sing while in another biopic on political leader Narendra Modi, Vivek Oberoi is playing the lead role of the Prime Minister.